I recently visited with Heather Shaw, whose husband, Pastor Darren Shaw, serves Faith Lutheran Brethren Church, Hendricks, Minnesota, and also Blom Prairie, just across the state line in Toronto, South Dakota. Blom Prairie and Faith have shared a pastor for many years, with the Shaws ministering there the past five years. Both communities are small; Toronto with around 200 residents, and Hendricks 700. Both have been similar sizes for decades, surrounded by farms and businesses that come and go. The churches are smaller than some in larger communities, but are growing and thriving! Heather says that she is so impressed with the outreach mentality that many of the women have. What can we learn from them? Each church has its own worship and more traditional activities, but they also join together for common purposes. Hendricks women meet weekly to quilt, and monthly for Bible Study. 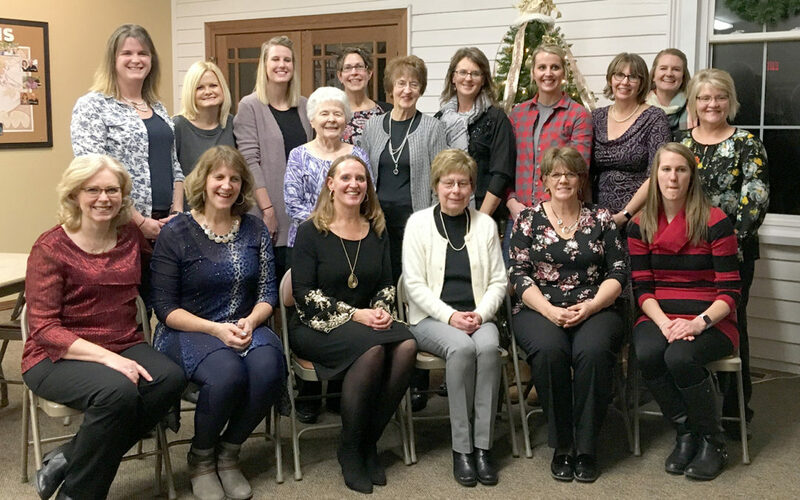 Quilting provides fellowship and support, and serves the community through warm quilts donated to nursing homes, local moms in need, a nearby homeless shelter, and to an auction for wells in Chad, Africa. Recently, youth have also expressed interest in learning from these older women. Toronto women meet for Bible Study and a devotional monthly. They do a few intentional outreaches as well, such as boxes for shut-ins, buying items such as coffee, cocoa, towels, etc.—assembling them together and then delivering them. The annual Christmas Tea is their largest event. Ruth Iverson envisioned this event as a “Gift to the Women of the Community” in 1989. She passed away weeks later, but the annual event continued to grow and give that gift to more than Toronto women. Women now come from many surrounding communities, and it has grown to over a hundred women! It has become the “can’t miss” tradition of multi-generational families with grandmas, moms and teenage daughters. Wassail or hot cider and warm greetings start the evening. Food has varied from traditional Christmas food, international food and décor, to chicken salad sandwiches, but it’s always a quality menu. A good speaker, plus a program with Christmas songs and the Christmas story always encourages believers as well as seekers to focus on Jesus, the true meaning of Christmas. Another gift to the community is “Echoes of Encouragement,” begun in 2016. Heather gathered a multi-generational core of women ages 25-70 to brainstorm common interests that would draw women together. The resulting free events have bridged gaps, and brought different women who don’t always come to church events. They have met at a fire hall, local restaurants, and once at church. Topics have included Flower Potting Frenzy; Clear the Clutter; Make-Ahead Freezer Meals; Straw Bale Gardening; Pickling for your Pantry; and Heritage Night. The buzz of conversation is heard as they do hands-on things together. Practical spiritual applications abound as devotional thoughts are shared in a non-threatening atmosphere. Their theme verse is 1 Thessalonians 5:11, “…encourage each other and build each other up…”—and this is happening! With a combination of tradition, innovation, and personal involvement, women are being reached. Praise God for what he is doing in churches large and small, in urban, rural, and small town settings!